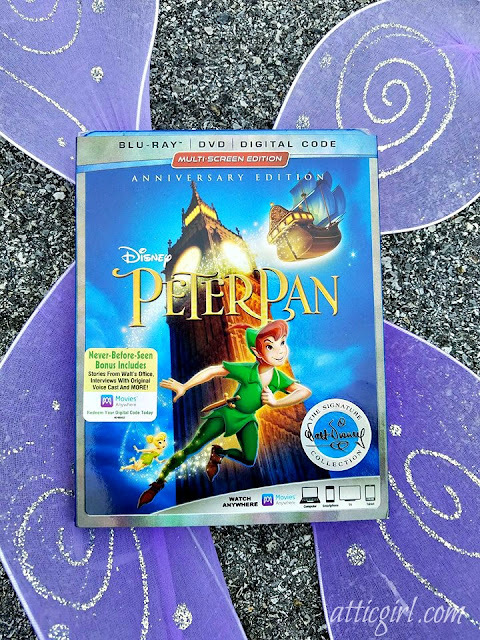 I received Peter Pan on Blu-ray for review. All opinions are mine. This post contains affiliate links. When you have kids, there are some classics that are essential for your home movie collection. 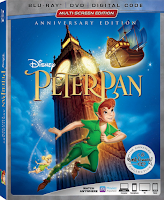 Peter Pan 65th Anniversary Walt Disney Signature Collection coming to Digital May 29 and on Blu-ray™ June 5 is one of them! What can I say about Peter Pan, other than it brings back great memories from my childhood? I fell in love with this imaginative story when I was little. Tinkerbell is my favorite character. She may be tiny, but she has a large personality! I love everything from the story line to the great music. My favorite song "You can Fly" inspires us to soar beyond our imaginations. I can't wait to share this classic with my two girls and enjoy the better quality of digital remastering! 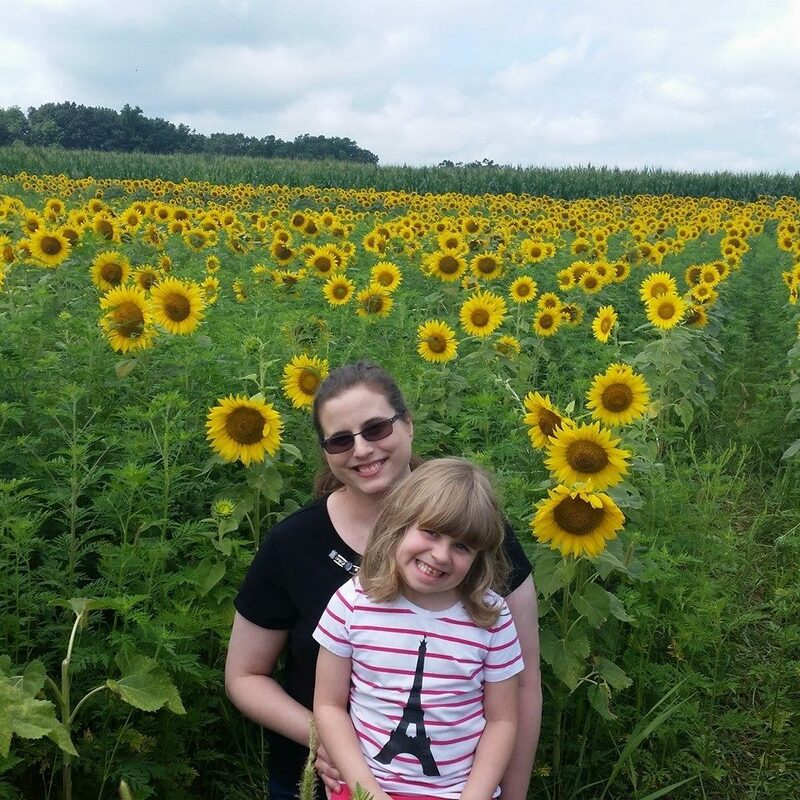 The great bonus features, including music videos, will have your kids singing and dancing along! The character’s name comes from two sources: ‘Peter’ from the name of the youngest of the Llewelyn-Davies boys, Peter, and ‘Pan’ from the mischievous Greek god of the woodlands. Peter Pan first appeared in print in 1902 in a book called ‘The Little White Bird,’ a fictionalized version of J. M. Barrie’s relationship with the Llewelyn-Davies children. The book was used in a very successful play ‘Peter Pan, or The Boy Who Wouldn’t Grow Up.’ This play premiered at the Duke of York Theatre in London on December 27, 1904. ‘Peter Pan’ was released in 1924 as a silent movie, directed by Herbert Brennon, starring Betty Bronson as Peter and Ernest Torrence as Hook. Working with the Great Ormond Street Hospital, Walt Disney was able to obtain story rights between late 1938 and early 1939. 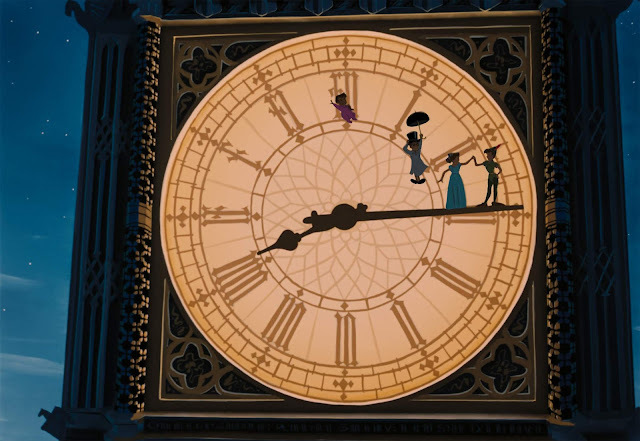 The reason behind the volume of backgrounds for PETER PAN, stems from the fact that the principal characters are ‘human,’ and humans have a tendency to move around more than animals. This determined the various camera angles needed to give the production the scope that Walt wanted for his telling of Barrie’s classic story. 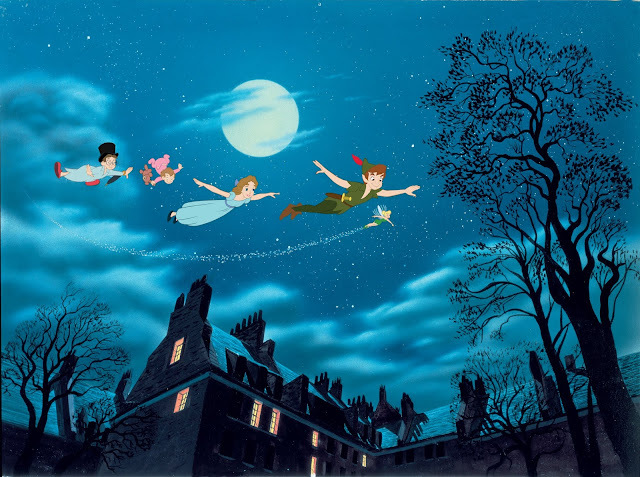 In the time required to design and paint one animated background for PETER PAN a live-action studio could plan and construct an actual movie set. The production of PETER PAN represented the highest concentration of talent with the studio’s history to that point. Though not a musician or vocalist, Walt had an incredible intuition about what music would appeal to audiences as well as what would work best for his productions. He worked closely with Oliver Wallace – a veteran studio musical director and composer. Wallace composed the instrumental score for PETER PAN. Jack Lawrence and Frank Churchill created the laugh hit – ‘Crocodile Theme’. Oafish and lumbering, this song clearly sent warning whenever the croc was lurking. 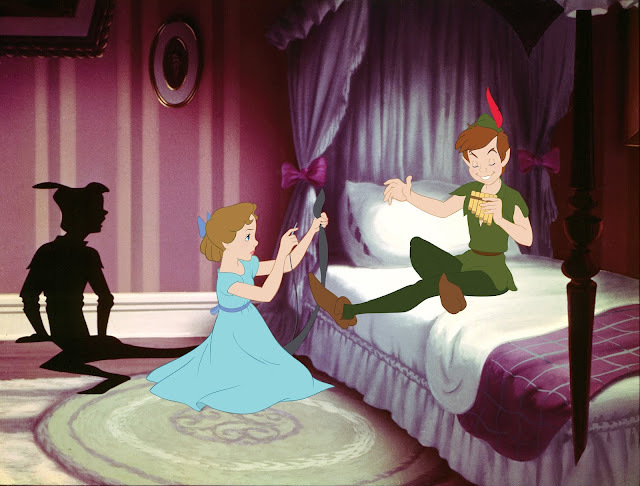 One of the main differences between the stage and screen Peter Pan was Walt’s decision to dispense with the old tradition that Peter should be played by a female actor. 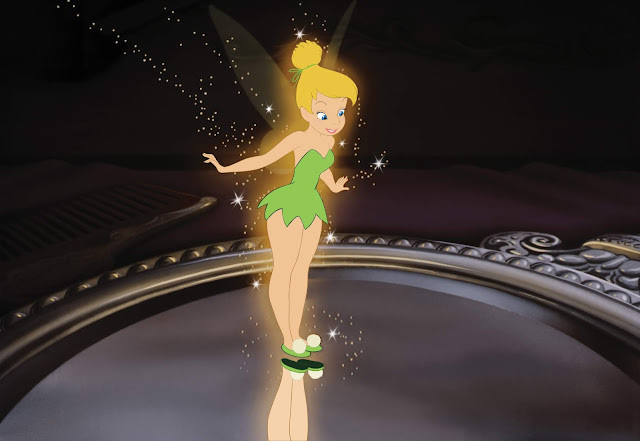 · Tinker Bell originally began as nothing more than a darting spot of light in the J. M. Barrie play, but on February 5th, 1953, Tink made her Disney feature film debut. Legendary animator, Marc Davis, was largely responsible for bringing her to animated life. Several women provided live-action reference for tiny Tink. Kathryn Beaumont, the young voice of Wendy, Helene Stanley and several other models, including Margaret Kerry provided inspiration for the actions of this diminutive sprite. The elder of the brothers, John is the epitome of a little boy in a hurry to become a grown-up with an appropriately stuffy voice provided by Paul Collins, personifying John’s screen image. Tommy Luske provides the voice of Michael Darling and it was widely reported that Luske’s voice broke during the movie’s lengthy production schedule. Margaret Kerry, the character model for Tinker Bell, had to supply some of the additional lines. Charming, devious and rotten to the core, Hook is a formidable villain to be sure. Yet, Captain Hook marks a change in Disney villainy in that he can be laughed at by all ages without diminishing the suspense of his rivalry with Peter Pan. Hook is voiced by the veteran stage and screen actor Hans Conried, who, in true J. M. Barrie tradition, also provides the voice of George Darling. He provided extensive live-action reference in addition to his distinctive vocal characterizations for both characters. Though Conried’s dramatic gesticulations are evident in Hook, many historians feel Hook also resembles his legendary Disney animator Frank Thomas while also attributing any element of niceness in Hook’s character originating out of Frank Thomas’ work and influence. 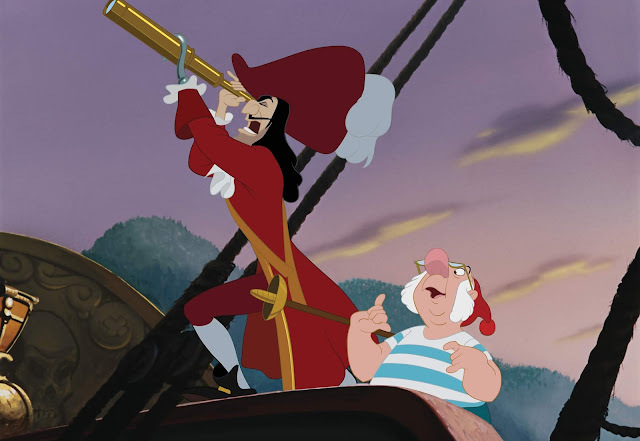 Smee is voiced by the versatile talent of Bill Thompson – the man of many voices. In addition to numerous vocal assignments for The Walt Disney Studios, he was also the voice of the White Rabbit in Alice In Wonderland (1951). As angelic as his appearance may be, in many ways Smee is still a black-hearted scoundrel when one considers the atrocities he is cheerfully willing to commit for his beloved Captain Hook. This cutthroat crew sings and dances as they swab the deck or sew up the sails on the Jolly Roger. Animated by Wolfgang ‘Woolie’ Reitherman, one of Walt’s Nine Old Men of animation, the Crocodile is truly a legendary character. Peter Pan is a classic that your family will want to watch over and over again, available June 5th on Blu-ray/DVD!